It is very important to get the largest bird cage when you are thinking of getting a finch bird cage for your beautiful finches. Although people often argue this fact due to the small size of finches, however small birds need larger space for movement especially for their flying which is a form of exercise for these finches. Comparing with other birds, finches needed a rather bigger finch bird cage as they need enough space for them to stretch their colorful wings to allow them to soar the skies, but in this case, is for them to fly around the cage. Another important fact to be reminded when owning a finch is that finches do not like to be left alone, meaning they need company, which indirectly means they need other finches to keep them company. This is because, comparing to other birds, finches feel very comfortable among themselves therefore they do not demand any extra attention from their owner. However, when considering of getting another finch to accompany your pet, it is important to get the same size finch, so as to avoid any fights or quarrel among them. This may seem funny to some, but quarrelling may lead to serious injuries to the bird, and if serious, the bigger size bird may cause the death of the other. 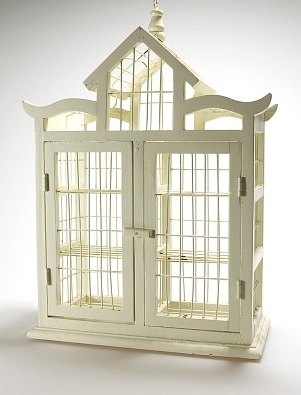 For a pair of finches, a finch bird cage that is needed would be at least thirty inches in width while the height is very significant as well. This is because it will be more difficult for the finches to fly side to side if the finch bird cage is much taller or narrower. Besides that, the finch bird cage’s bar should also be not more than half an inch apart, to avoid the finches from getting caught in between them. If you would consider of bringing your finches on flight, it is also recommended to take the flight bird cage which are usually wider and larger in size as comparing to the normal bird cages. When choosing the best finch bird cage for your pet, the best option is always stainless steel as it would not be harmful to your finch in terms of health as it is non-toxic. Apart from that, stainless steel would not rust as well, so it is very safe for the birds and moreover, disinfection and cleaning would be much easier compared to other materials. If it is very difficult to find a stainless steel finch bird cage, the other alternative would be bird cages made from hard plastic. This is also similar to stainless steel as it is also non-toxic and safe to be used as well. It is also very much lighter in weight comparing to a stainless steel cage, which is easy for shifting or repositioning the cage when necessary. Choosing the right finch bird cage is very important to ensure the comfort of your finches so that they may live happily and healthily too.